MEXICO is the kind of country that grabs you by the throat and shakes you - or perhaps that's just effect of the chillies in the cooking. The weather, the food, the people - everything has a touch of spice. The parched desert, the fiery food, the scorching senoritas and the bite of tequila as it hits an empty stomach. These days, of course, parts of Mexico are hot, hot, hot with holidaying celebrities too. You can't go to Los Cabos without falling over Jennifer Aniston or Beyonce. On the downside of course, nothing ever happens on time (manana, manana), machismo is rife and the capital city is crowded and polluted. Still I defy you to leave without a passion for the place and away from celebrity central there is a whole other Mexico to explore. Nowhere is the spirit of old Mexico so apparent as in Oaxaca, a UNESCO world heritage site 155 miles (250 kilometres) south of Mexico City but a world away in terms of its coloured colonial buildings and its shimmering, magical light. The first thing you need to do when you get there is prove that as a seasoned luxury traveller you already know how to pronounce its full name - that's Oaxaca de Juarez ( C'wa-HA-ka dey WA-rez ) right! The second is to head for the Zocalo, the city's central plaza and install yourself on a second- floor restaurant balcony to watch the world go by. Late on a Saturday afternoon the square is full of traders with bobbing bunches of fiesta-bright balloons and families out for a weekend treat under the colonial arches that surround the square mariachi singers in sequinned sombreros serenade the tourists. We'd been travelling in Central America for a while so the words enchilada, tortilla and tacos on the menu were horribly familiar and a girl can eat only so much guacamole. But chocolate chicken, there was something that was definitely different. I ordered the black mole (chocolate sauce), a speciality of the region made from the unsweetened cocoa bean in a tradition that dates back to the Aztecs. There were chillies in there somewhere so I headed down to the square to buy something to cool my mouth. Kid's candies? No, they were chilli flavoured. A slice of street stall pineapple? Perfect But as I passed over my pesos the vendor frosted the fruit with a shower of red powder. Yep, chilli again. For a more refined contemporary take on classic Mexican cuisine head to Los Danzantes restaurant. 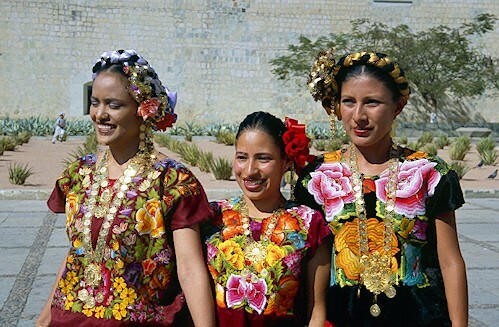 ART LOVERS who want to see women in FRIDA KAHLO-esque traditional dress are fortunate because Oaxaca is the place to do it. The Mexicans regard the gringo diet as bland beyond belief and I'm told if you live here for awhile your tastebuds cease to burn and even breakfast is a chilli-fest. My husband, who spent time in Mexico in his misspent youth, still pines after 'huevos rancheros' - eggs with refried beans, chilli and hot sauce- which sounds far too fiery for early morning to me. However, there are other things about Mexican traditions that definitely appeal. The gracious old convents turned into inns for example. A short distance from Zocalo square is Camino Real Oaxaca a converted 16th-century convent with interlocking courtyards and bright geraniums everywhere. The Luxury Travel Bible recommends a stay. For a slightly less luxe stay another appealing hotel is Casa Oaxaca a cool sanctuary with walls covered in contemporary Mexican art. Art lovers who want to see women in Frida Kahlo-esque traditional dress are fortunate because Oaxaca is the place to do it. People are very proud of their regional dress here. Outside Santo Domingo church on a bright spring morning I watched the wedding of a well-to-do family. The groom had a black velvet jacket spun with gold braid and the women had flower print skirts and blossoms in their halt underneath the shade of a tree an old lady with her hair in elegant grey plait sipped sangria. Even when people aren't in regional costume there is flair to what they wear. Your basic beige just doesn't work with women here. Think bright colours and flounced layers. Think Salma Hayek. And in a country where men are still macho with a capital "M"' luxuriant moustaches area must. Next to the church, housed in the old Dominican convent is one of the world's most beautiful museums, the Museo Regional de Oaxaca. We wandered through cool courtyards and along corridors with vaulted ceilings into rooms full of gold Zapotec treasure. To see where the treasure came from you have to head for Monte Alban, the ruins of an ancient capital just a few miles/kilometres west of the city. There are other Mexican monuments which are more impressive - Chichen Itza, the famous Mayan ruins near Cancun or the giant pyramids of Teotihuacan near Mexico City - but Monte Alban is a gentle introduction to the wonders of the old Mexican civilisations with their blood rituals, feathered headdresses and powerful priests. If old stones aren't your thing, an early morning excursion is still worth it for the spectacular views from the flat-topped hill. Those who do want to take the time to explore should wander down to the tombs to look at the painting and geometric friezes. As we emerged into the daylight a vendor with a face like an ancient carving tried to sell us an 'original artefact' miraculously preserved since 500BC. For a more authentic souvenir it is worth heading to the weaving village of Teotitlan. The patterns used on the rugs today are not so different from those on the friezes that cover the ancient walls. Many of the best weavers still use natural dyes which makes the quality of the colour - the reds and blues and Aztec yellows - even more amazing. In a dusty back yard we watched three generations of weavers stir an inky vat of indigo ready to dye the rough wool. The family's use of hand-looms meant a decent sized rug could take months to complete and explained some of the more spectacular prices. If you don't fancy lugging home a carpet then a bottle will always make a good gift. For most tourists it is tequila which is seen as the Mexican tipple of choice but the national drink is really mescal (tequila is only made in some states) and the best mescal comes from just outside Oaxaca. On the road between Tiacolula and Mitlawe found a number of small distilleries and shops selling mescal. We stopped at one with a wooden bar lined with different flavoured mescal. Everything from peach to pepper had been added rather like they do to schnapps or vodka. At the back grew the agave plants from which the liquor is made. Several tastings later the world had an amber glow. Did I eat the worm? I can't remember but I do know l ate a plate of hot tamales without even blinking. Clearly it was time for some R & R and what better place than Bahias de Huatulco, a forty minute flight south, with is rocky headlands and golden beaches. Playground of Moneyed Mexicans and dollared-up norteamaricanos this not yet as built up as Cancun or as celeb-ed out as Los Cabos. One of the coves, Playa Cacaluta, was where they filmed 'Y Tu Mamá También'. The Luxury Travel Bible recommends renting a private house on the cliff top. Renowned Architect, Carlos Herrera built two luxury hideaways here. The first La Picuda, with its Toblerone triangle patio was inspired by IM Pei's East Building at the National Gallery of Art in Washington and was recently on the market ,for sale for a $US 3,250,000 (we told you Mexico was hot!). The other Zicaru, with a private beach open-air living space looking across the infinity pool and the ocean beyond is available for rent (see luxury links).